Desserts with only a few ingredients can still taste amazing. 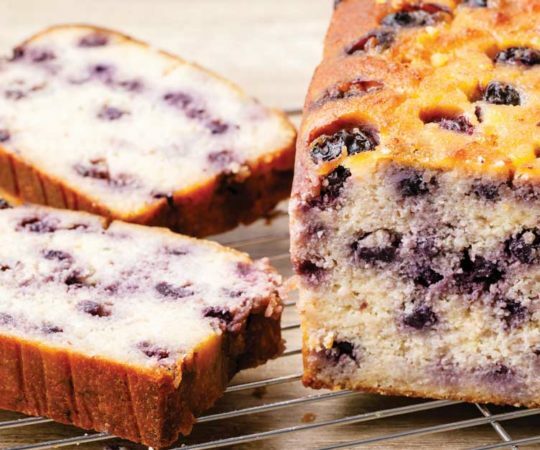 In this recipe blueberries are baked and topped off with sweet almonds. The blueberries start bubbling in the oven and the almond crumble turns a nice golden brown. A sweet cinnamon smell starts permeating the kitchen as it bakes. Then the warm dishes come out of the oven in a beautiful shade of purple, ready for you to enjoy. 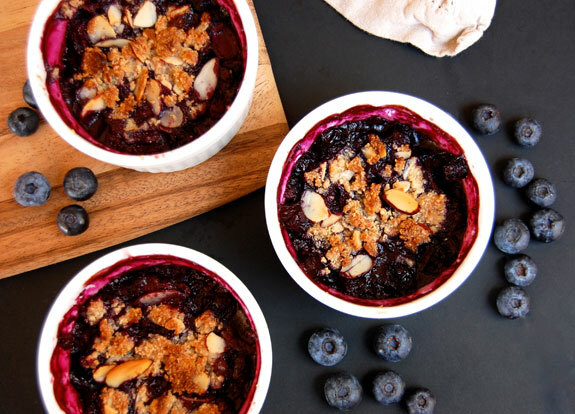 The recipe begins by tossing the blueberries with a hint of lemon and dividing the fruit among six ramekin dishes for easy serving sizes. As a side note, I think that frozen blueberries would leave this dish too watery, so I recommend fresh blueberries for the best result. Then the slivered almonds and almond flour are mixed together with sweeteners and cinnamon to make the crumble. Feel free to really heap the blueberries and almond crumble into the ramekins because they will cook down in the oven. You also have the option of sprinkling coconut flakes on the top for added sweetness. I will definitely be using this recipe bake blackberries and pears with the crumble topping, perhaps even mixed together with blueberries. I look forward to trying it during the peak of summer when berries and peaches are at their finest. 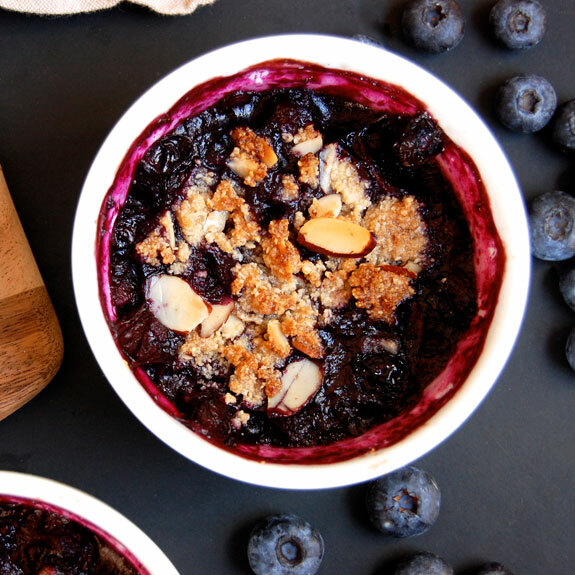 This gluten-free blueberry crisp is not only quick and easy to put together but also tastes incredible. 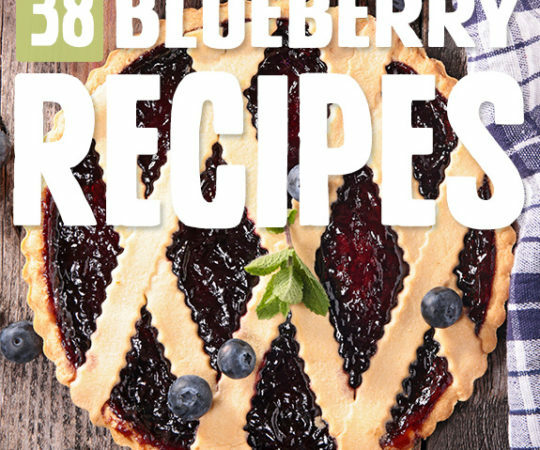 The taste is up to par with blueberry pie, without the major time commitment of making pie crust. 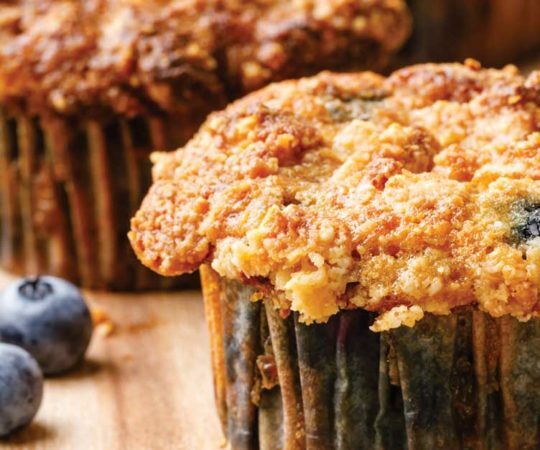 The almond crumble on top adds just the right amount of crunch to the blueberries. 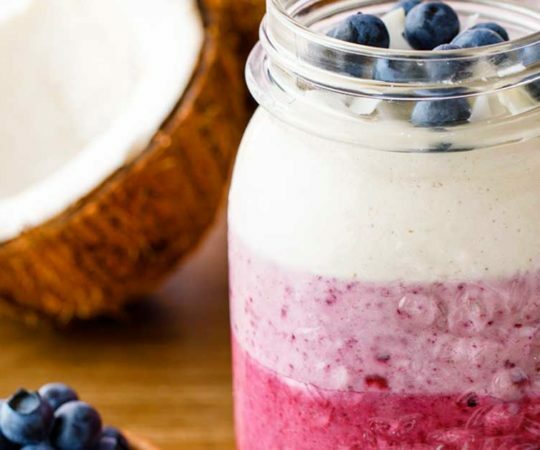 So go ahead and satisfy your sweet tooth while keeping the dessert course healthy. 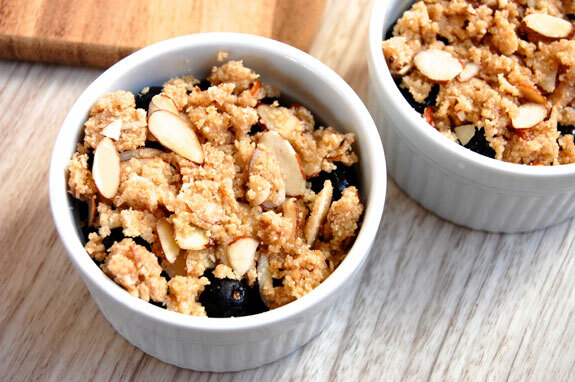 Fresh fruit makes a wonderful sweet dessert option, especially when baked in the oven like this blueberry crumble. The recipe could serve as individual-sized desserts for six people, but you might not be able to stop eating after only one. These will be gone in a flash. 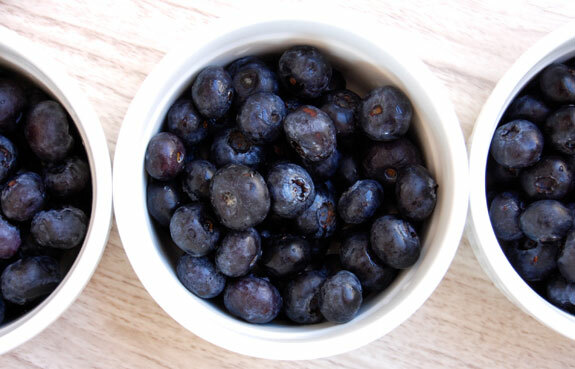 Preheat the oven to 375 degrees F. In a small bowl, toss the blueberries with the lemon juice. Divide between six ramekin dishes. Using the same bowl, mix together the remaining ingredients until combined. 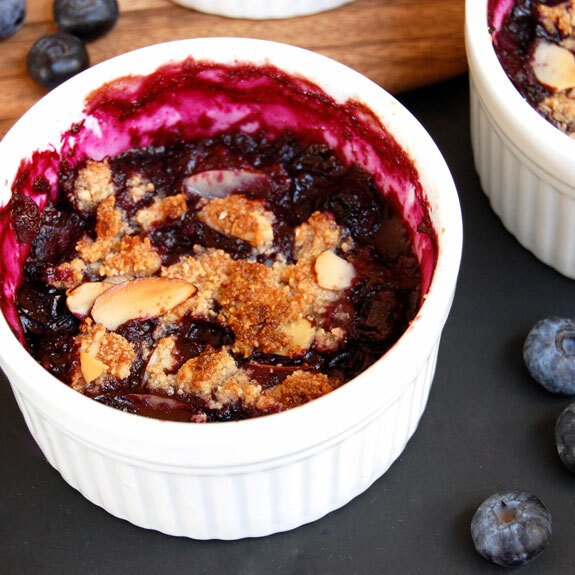 Spoon the almond crumble over the blueberries. Bake for 30-35 minutes, until bubbly and golden brown. Let cool slightly before serving. I have a bunch of frozen wild blueberries that we picked this last fall, would that work instead of fresh and if so how do you recommend the prep? I believe that frozen blueberries would also work well, just allow them time to thaw before mixing them into the recipe. I do this with frozen berries all the time. No need for them to thaw. I do toss in a couple tablespoons of almond flour and/or arrowroot to help thicken them. They are very wet, even when frozen with all the air removed from the bag. It works well and is delicious. I’m an ‘eyeball’ cook and I’ve been making these for years using the same ingredients. You’ll love it. I don’t own ramekins :(; do you think this would come out ok in an 8×8 dish? It should definitely work in an 8×8 baking pan. Let us know how it turns out! Yes, of course, this cobbler will work in an 8 x 8 pan. I am doubling + 1/2 and making it in a 9×13 will keep you posted! Would it alter the results to make in a pie pan or square glass pan? see that someone else already asked that question!! I’ve got these in the oven right now! It was so easy to make and the flat smells amazing. I can’t wait to eat them! 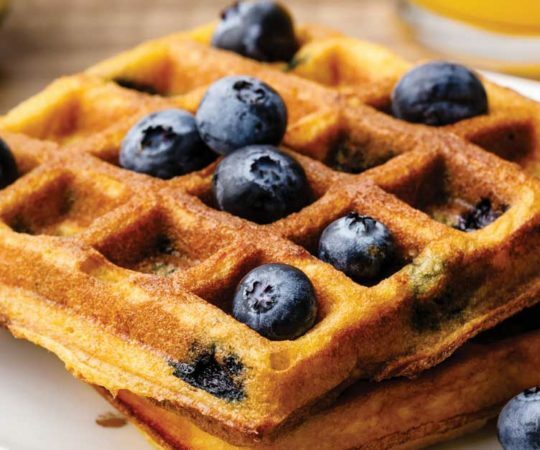 Made these with fresh blueberries and then also fresh peaches for various picnics- just adjusting the amount of syrup slightly to the expected guests, or the sweetness of the fruit. A big hit every time! Very versatile. Thank you! Can I replace the syrup with Swerve? I just made these, and put them in the microwave for 2 minutes each. They are very good!! A little runnier than normal cobbler, but very good! 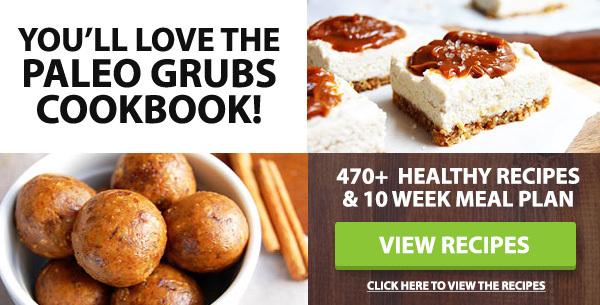 I’ve made these with fresh blueberries, frozen (thawed) mixed berries, and both were so good! Next I’m making them with frozen sweet cherries. This is an EXCELLENT recipe — as its name implies! It’s the topping! It will go on any berry. I’m also planning to try a strawberry rhubarb version–though I may have to add a very little sweetener for this. And I love that they’re baked in ramekins — portion control for my husband and me! I double the topping recipe and make this in a 9×13 glass baking dish. Also have made it with fresh peaches and it’s wonderful! Definitely a treat I never expected. This is just the best thing I’ve eaten since being put on the SCD diet! I subbed apple sauce for the maple syrup (+ a bit of stevia) & was in heaven. Thank you!! Tried a few alternations – added 1/4 cup of oats and 1/4 of almonds instead of the 1/2 cup of almonds to reduce the fat. I also had some fresh cherries which I used. Due to the cherries, they came out soupy. I think next time I will add some corn starch or tapioca so it thickens while it bakes. I also added coconut whip cream on top. 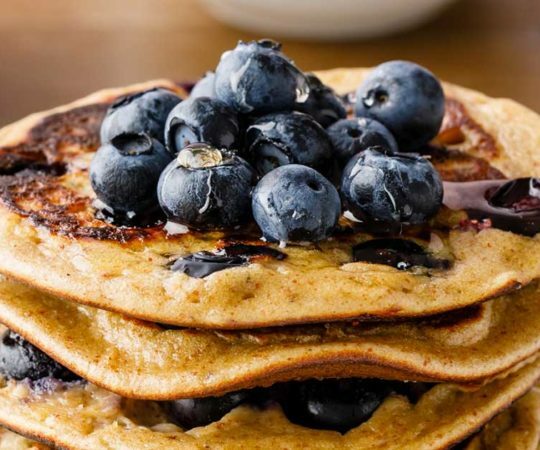 You can, but coconut flour is very different than almond or other nut flours. You will only need about 1/4 of the amount of coconut flour. If you make it with coconut flour, let me know how it turns out. Love this recipe. I used 2 cups of fresh peaches and 1 pint of fresh blueberries. Heavenly! Better then frsh fruit pie because you don’t have all that crust. Just a tasty crumble. I bought 8 little ramekins and they worked great.